It was only a matter of time before a filmmaker turned the gig-economy into a vehicle (no pun intended) for a nightmare. A while back, I reviewed a small movie called Fare, which was conceived, shot, and completed over the course of a few days. While the wear and tear between the seams of the production were noticeable, it was at the very least an interesting thriller/creep horror/dramedy using rideshare app driving as its setting. The setting, mind you. Not full-on philosophy. 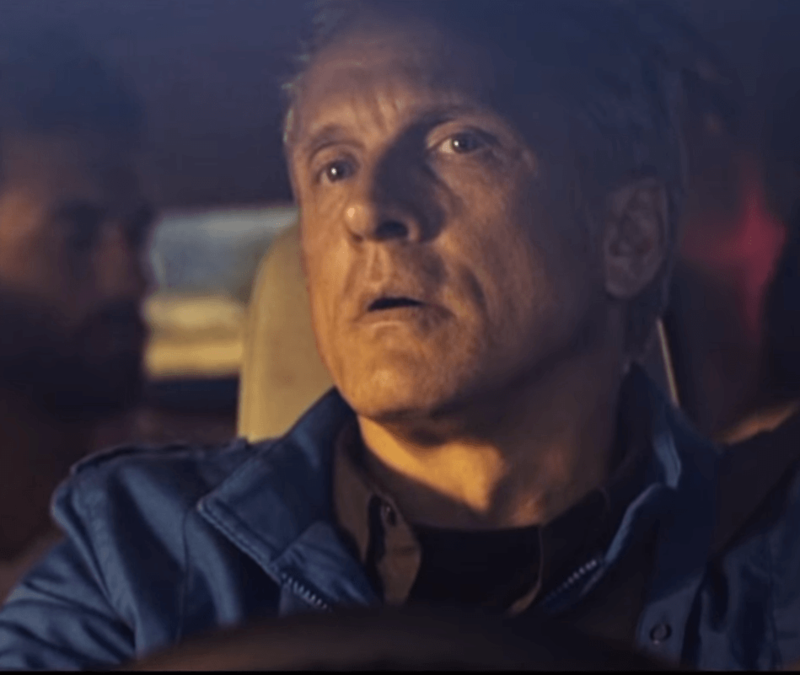 DriverX is the not so rare movie that tries to have its cake and eat it too, being a criticism of and a romantic letter to working and living on demand in the late 2010s. It’s a mess of comprehension, a hodgepodge of youngster stereotypes and condescension, and a suburban fantasy that isn’t as realistic at the moment. It’s just so out of touch. Third, Patrick Fabian plays Leonard not sympathetically or nebbish as you would expect. He’s nice and all, but also a bit passively sarcastic and annoyed by people, and I don’t just mean his passengers. Some of this may be the writing, as Leonard does walk and talk with self-important weight, a sort of “poor me” complex. It’s supposed to make us feel for him, and we do, but not how the filmmaker intends. Sometimes we’re on his side when his wife belittles him; sometimes we’re disgusted when he lets his hand reach up a skirt – an act that he agrees would’ve gotten him into trouble, but one that he felt somehow entitled to as someone whom the world has passed by. Fabian tries to juggle so much with the role, that it all falls to pieces all too often. It’s fubar of writing and directing. So many notes, so distressing, so little follow through. And fourth and a bit of fifth, DriverX attempts to show the gig economy as a Capitalist scheme under the dangling carrot of “freedom” (which it is), all the while using the propagandistic notion of its “inherent” romanticism to paint a story of finding oneself and falling in love with life all over again. Which is it? I don’t know. Can it be both? Maybe, but it’s too harshly piled on here. Leonard doesn’t so much have an arc where he changes but a peak that he ultimately stays at, never budging or wanting to move. His crisis continues, and it’s all his fault. DriverX made me a bit mad, honestly. A holier than though story where a genuine generational finds little redeemable in the current crop, only to indulge in their excess and breathe a breath of fresh air, thinking he’s found a spirit of sorts to connect with. Little resolves, mostly revolve, and gives way to its own travesty, believing it’s a triumph. DriverX plays at Chalmette Movies starting this weekend.